The Norfolk Sloe Company is a family run business based in Fakenham. The company which started in 2011 delights in producing award winning Black Shuck Sloe Gin, Black Shuck Sloe Gin Chocolate Truffles and a range of Black Shuck fruit liqueurs. The company prides itself on making the most of local produce, and combining generous amounts of fruit with quality high strength spirit to create delicious liqueurs for all occasions. In 2014, Black Shuck Sloe Gin was one of 150 products selected from over 10,000 entrants to be awarded the prestigious 3 stars in the 2014 Great Taste Awards. In 2015, The Norfolk Sloe Company was invited, by Elizabeth Truss MP, to be one of just 50 DEFRA Food Stars in recognition of its achievements to date and its entrepreneurial potential for future growth. 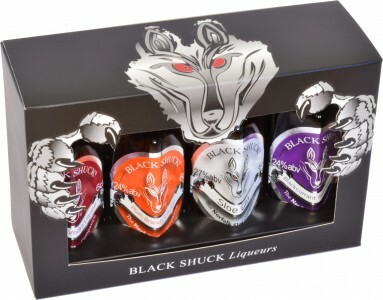 The stunning Black Shuck Liqueurs Gift Pack, containing four 60ml bottles of liqueur, a guide to cocktail making and the legend of the Black Shuck is already proving popular and is surely destined to end up in many adult Christmas Stockings this year.